Over the past six months a friend has been writing me emails as she inches towards using one of her Whimsy & Tea towels. A towel she bought several years ago has moved from the drawer to hanging on the oven with the tags still on it. Yesterday brought an email with “Breaking News” in the subject line: she had dried her hands on the towel twice, after first making sure that her hands were very clean and not too wet. “Wow, was that towel soft and welcoming,” she added. I understand the desire to keep the towel looking new, crisp, and beautiful and the concern that by using it, it might get stained with ketchup or soy sauce. I was weaving the other day and threw the shuttle a little too hard. It flew across the loom and almost hit my yellow lab Codi, who was snoozing on the floor next to me. This was not the first time it had landed on the floor, nor will it be the last. I picked up the shuttle and examined it. I was saddened by all the nicks and worn spots. Then as I held it, my perspective on these scars shifted. I started to appreciate the thousands, probably millions, of times the shuttle has gone back and forth, back and forth, carrying the weft thread as I have woven hundreds of towels. No wonder it has scuff marks where it has raced along the metal reed. This shuttle has nicks and dings because I use it. I have a few newer looking ones in a basket on the shelf, but these are the ones I rarely use – one because it’s too small and light, another because it’s too large and heavy, a third because the ends are a little too pointy. Weaving is part of my daily life, so I’ve treated myself to tools that I really like – beautiful shuttles that are the right size, shape and weight for my hands. In order to weave efficiently, I’ve had to let go of worrying about dropping my shuttle from time to time. I’ve had to learn a balance between loving the things I own and use, and holding them lightly; understanding that using them, no matter how carefully, means some wear and tear. Like my favorite jeans. They are the ones that are the most worn and faded, precisely because they are my favorite and therefore the ones I wear the most. The signs of wear and tear are the trade off for everyday comfort, walks in the woods with Codi, and working in the garden. A kitchen towel is a tool of sorts. It can get a workout assisting in the preparation of meals. Personally, I use mine for drying clean hands and dishes, not for wiping up spills. Even so, with repeated washing it is on longer as pristine as it once was. But every time I dry my hands on it, I enjoy its softness and appreciate how absorbent it is. 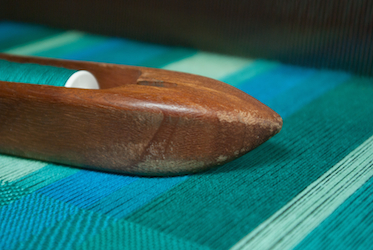 Sometimes I miss the initial smooth, polished surface of my weaving shuttle. But the joy I’ve experienced throwing it back and forth far outweighs any frustrations about the scratches and worn spots. I hope that my friend eventually finds that the pleasure of drying her hands on a soft, welcoming kitchen towel is worth a possible stain or two. That object you’ve been reluctant to use – I want you to know it’s really okay to use it. Please, please give yourself permission to use it. 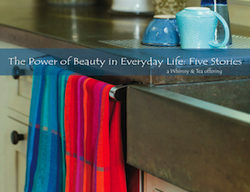 My invitation to you: Is there something you own and haven’t used because you are concerned about stains or scratches? What if you used it once as an experiment? Please let me know how it feels.